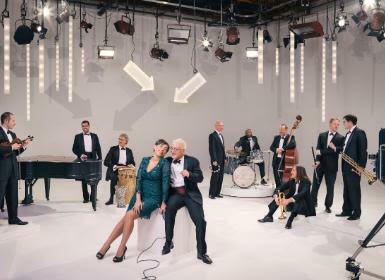 eaturing a dozen musicians, Pink Martini performs its multilingual repertoire in over 25 languages on concert stages and with symphony orchestras throughout Europe, Asia, Greece, Turkey, the Middle East, Northern Africa, Australia, New Zealand, South America and North America. Pink Martini made its European debut at the Cannes Film Festival in 1997 and its orchestral debut with the Oregon Symphony in 1998 under the direction of Norman Leyden. Since then, the band has gone on to play with more than 70 orchestras around the world, including multiple engagements with the Los Angeles Philharmonic at the Hollywood Bowl, the Boston Pops, the National Symphony at the Kennedy Center, the San Francisco Symphony, the Cleveland Orchestra, the Sydney Symphony at the Sydney Opera House, and the BBC Concert Orchestra at Royal Albert Hall in London.